At this time of year, us gardeners are often asked the same old question: ‘There can’t be much for you to do on the allotment in November, can there?’ Ah my naive wee inquisitor, how wrong you are! But I’m not going to just give it to you straight, you’ll have to wait until next weekend for the latest tale of adventure and high jinx on the allotment. 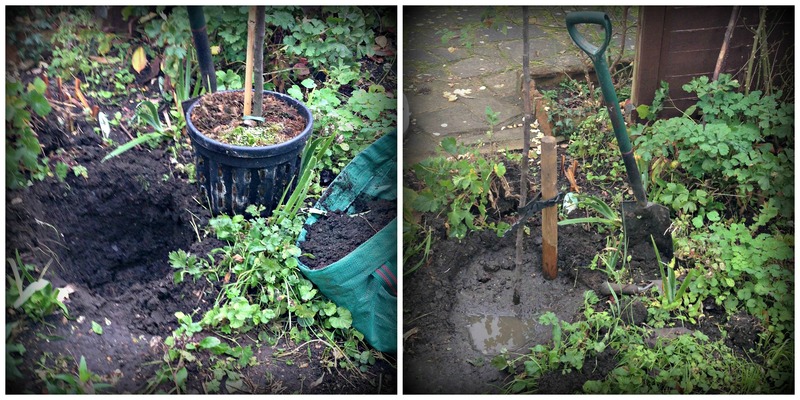 This week, my work in the garden continues as I put spade to soil to make way for a new addition to the garden family: my new crab apple tree. We are very lucky with the amount of wildlife that visits us throughout the year. However, I want to ensure that next year we continue to bring in more, and I had read that this particular dwarf crab apple tree is not only fragrant with a fantastic blossom, but it really encourages wildlife. I also have a plum tree and a cherry tree which are always up for a little bug love. I’ve planted trees before so the confidence and experience are there, apologies for the swollen ego. Nevertheless, it’s always good to keep an open mind and embrace new knowledge and techniques, so on this occasion, I took a peek at the internet – I never knew there were so many ways to plant a tree! I’m going to tell you the way I’ve done it and you in turn can assume the role of Julius Caesar and pass judgement on me. My soil is fairly neutral but with a good dark loam texture, so I dug the hole wider than the tree’s footprint and to the depth of the pot it was planted in. I didn’t want to place the tree any deeper as the soil could have a rotting effect on the newly submerged trunk. Removing it from the pot, I then loosened the roots to encourage growth and sprinkled Rootgrow (http://www.rootgrow.co.uk) on the roots. Placing the tree in the hole, I then dropped well-rotted compost around the sides of the rootball and not underneath, why? I want its roots to spread out and establish a firm base. If I place the compost underneath the tree then it could become lazy and remain in its footprint and not seek out new nutrients thus weakening tree growth and development. The next stage was to backfill about two thirds and water in. Once the water had disappeared I completed backfilling, healing in and a further water. 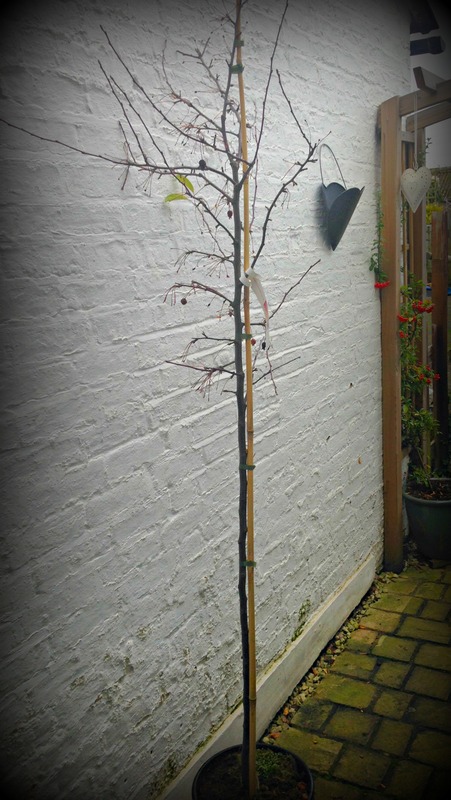 The final steps were to tie the tree to the stake, mulch the base (to project the roots from the oncoming winter weather) and wrap a grease band around the bottom of the trunk to prevent nosy pests. So there you go, next Spring will tell me if I’ve done the right thing and given my latest addition a good start to its new life with Agents of Field. But before then I’m keen to see what birdlife will use the branches for respite. Don’t overdo the compost. The mix generally considered about right is 25% good stuff and 75% soil that came out of the hole. Too rich a mix and the roots stay where the compost is; trees are as lazy as the rest of us. Whether you put compost under the tree or not is up to you – I like my tree roots to go deep so they can find moisture when we get a really dry summer. However whichever way you play it, it is really important to fork the bottom of the hole over to make sure that there is good drainage at the outset. 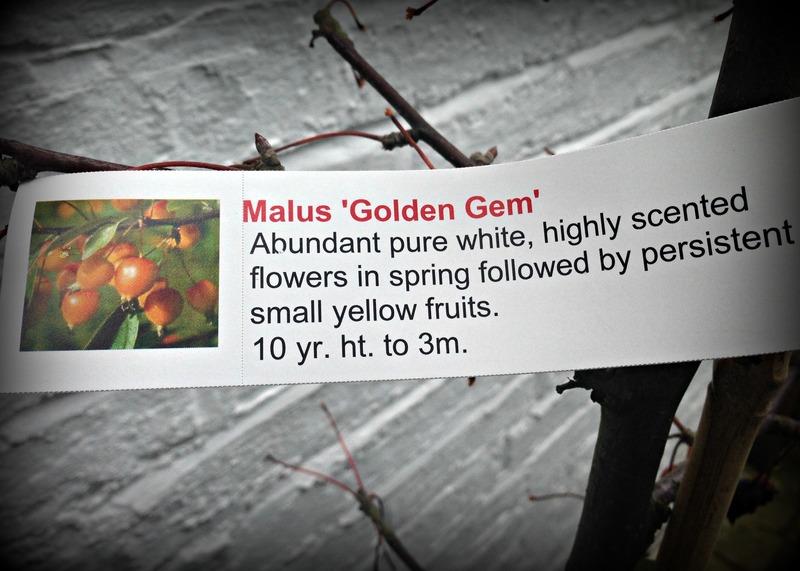 I also hope that you pick some of the crabs – Golden Gem is a terrific variety for crab apple jelly, just about as good as the Chinese Crabapple (Malus hupehensis) which is also great for wildlife. That’s great to know, many thanks Julian. I look forward to crab apple jelly next year.